It’s never too early to prepare your closet for the hot styles set to dominate in the months ahead. To give you a little help, here’s two top points from our footwear trend forecast for 2017. Follow these points and you’ll be ahead of the fashion curve for the next season. Props to style blogger Lena for the top image—follow itslenatime on Instagram for more! 2017 is NOT the year to trade in comfort for looks in the big world of sneaks. You can have it all with styles that deliver on fashion and function. 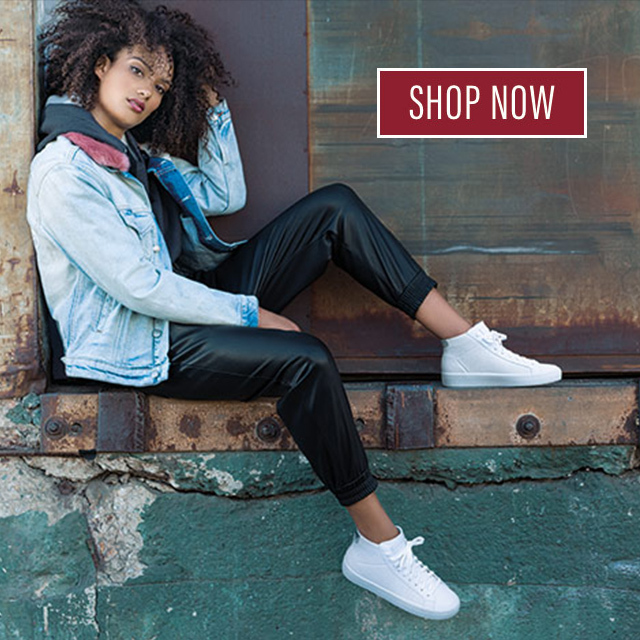 Fortunately, Skechers offers to achieve this look that are on point—here’s a few to consider! The women’s Kort Klassix with a gold trim is a classic choice for going the stylishly comfy route. These sneaks are so trendy that you could dress them up with a stylish maxi for an instantly chic ensemble! Did I mention they are extremely comfortable…? BONUS PROTIP: This style also looks GREAT with denim! How about a slip-on to complete your wardrobe this season? Look no further than the OG Double Up-Sleek Street. The blush color will add a simple neutral tone to your outfit. This color will always be trendy, and so will this style. Each of these timeless profiles featured a Skechers Air-Cooled Memory Foam insole to ensure that you can walk for days and still feel amazing. BONUS PROTIP: Try to stay away from bright colors when wearing a pair like this. Neutral colors such as blush complement other neutrals! For 2017, we’re loving simplicity when it comes to fashion. Looking stylish shouldn’t be so hard, right? Life gets super easy with slip-on shoes and the casual knitted look is coming in hot this year so kick back and check out your options! It’s just the beginning for the knit-sneaks trend and Skechers has countless styles in this category. The Flex Appeal 2.0—Insights in black and white hits this trend perfectly. Easy to coordinate with any outfit, these shoes are multi-purpose and ready for whatever unfolds. And with the cozy sock-like slip-on design you’ll for sure want this option in your 2017 closet. BONUS PROTIP: If you’re aiming for the athleisure look, think beyond yoga pants—ripped jeans pair great with these shoes! Tired of shoe laces constantly getting untied or having to tie them at all (I know I am)? Luckily, the 2017 fashion forecast is stocked with slip-on shoes waiting just for you. The women’s Relaxed Fit: Empire – Game On multi-colored sneaker blends in comfort, a flare to your outfit AND the knitted upper trend all in one. Don’t miss out on these! BONUS PROTIP: When you rocking the colorful sneaks, make sure your outfit is a single solid color—it’ll make the shoes pop even more than they would otherwise! What are the hot trends that you’re most looking forward to in the months ahead? Let us know in the comments or show us how you rock your favorite style by tagging #SKECHERS on Instagram and Facebook! I LOVE your shoes! So comfortable! Beautuful styles! Thanks! Does skechers memory foam laytex free or does it contain laytex? Hi Teresa! No, the Memory Foam footbeds do not contain any latex. Thanks for your interest! I am having trouble finding any shoes to fit me. I am a womans size 12 1/2. I have a narrow heel. I also have over- pronation. I usually wear unisex looking mens shoes, but they are generally too wide. Will Sketchers ever make womens shoes larger than a 12?